The transformation of public opinion and political buy-in has been dramatically positive since the first road was completed and the benefits were visible. Today, communities demand Tender SURE quality of road and footpath projects. The TENDER SURE project has begun a snowball influence on city and state governments across the country, to adopt standards for the design, contracting and maintenance of these city roads, thereby having a direct impact on how we experience our roads as pedestrians, bicyclists, motorists and street vendors and replacing the urban noise that we now experience, with more aesthetic and people-friendly cities and neighbourhoods. TENDER SURE has enormous potential to be scaled across the country. To give a sense of the importance of having such standards, a High Powered Committee under the GOI estimated India’s Urban Infrastructure needs, placing the total cost at over $1 trillion over the next 20 years – of this, close to 50% or $500 billion will be spent on local city roads, tens of thousands of kilometres across 8,000+ urban settlements. The Tender SURE Guidelines (Volumes 1&2) have been in demand by municipal governments, contractors, design consultants, project management consultants across the country, and used for development of their own local road projects and contracts. The guidelines provide the methodology to replicate this kind of redevelopment. They provide solutions for urban street design in India both in terms of design and execution. The guidelines are structured to adapt to context based on design capabilities, budgetary allocations and political will. However, it is important to note that each road has its own unique characteristics that demand careful detailing and integration – this is not a simple “cut-paste” exercise. 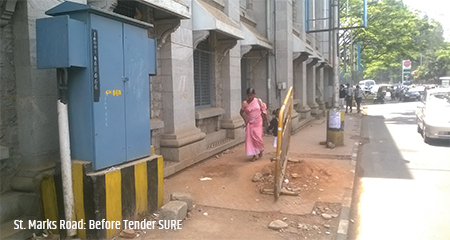 Bangalore municipality has hosted visits on the Tender SURE project from numerous representatives of cities and states across India that are interesting in replicating the Tender SURE model. Chennai, Davangere have included Tender SURE roads as a key project in their approved budgets. Pune’s Commissioner has been inspired by Tender SURE to produce guidelines for Pune. Nagpur in Maharashtra has recently allocated Rs 700 crores for Tender SURE roads. In Hubli – Dharwad in north Karnataka, Tender SURE roads have been designed by Jana USP and are currently under construction. Based on the success of the pilot roads, the government of Karnataka has allocated over 1000 crores towards Tender SURE roads. The interesting collateral benefit has been the upgradation of engineering and design of non-Tender SURE road-works in different parts of Bengaluru city. Engineers and contractors have begun to utilise different components of Tender SURE specifications in their projects. Many engineers are embracing the specifications of pavers, of bollards, of kerbstones, street lights etc. Regardless of this piecemeal execution of Tender SURE components, it is nevertheless improving the engineering capacity and standards of roads redevelopment across the city. Tender SURE is also putting on notice all consultants and contractors, forcing them all to improve the standard of design and delivery. Design consultants and architects are now eagerly climbing on to the Tender SURE roads redevelopment bandwagon. In addition, there is now an acceptance across the senior levels of service providers, on the need for taking cables underground. The focus is also on the financial recovery of capital expenditure through annuity charges from telecom services, etc. 1. 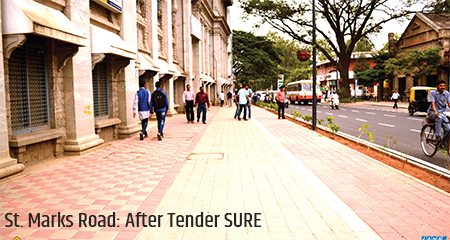 15 kms of well-designed Tender SURE roads in Bangalore, improving traffic movement, and revitalizing the CBD. 2. Seven utility networks scientifically laid within the footpath on either side of the road, with regular access chambers for maintenance: water, sewer, storm water, power and telecom. 5. 400 designed spaces for organized on street parking for cars, two wheelers, cycles, autos.